A heat exchange is a device that transfers thermal energy using fluid such as liquid and gas. Heat exchangers such as radiators, oil coolers, charge air coolers, and EGR coolers are essential devices for automobiles and industrial equipment. 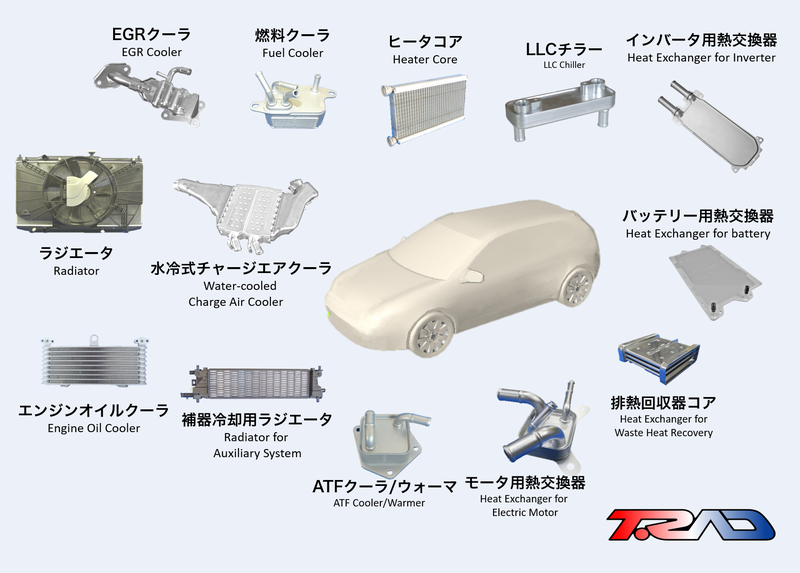 We have been the pioneer creating a field of heat exchangers over 80 years since the establishment of Toyo Radiator Manufacturing Co., Ltd. in 1936, contributing to the development of the automobile industry consequently the Japanese economy. Our products realize high performance and durability having been used for various kinds of machinery for construction/industry/agriculture as well as mainstream models of automobiles/motorcycles in Japan. In addition, our radiators, which enable higher performance of motorcycles, are used worldwide including the biggest market, the ASEAN countries, which demonstrates that we lead the market. In a heat exchanger, the fluid media is cooled or heated through the metal walls. Such walls are made from aluminum, stainless steel or copper depending on the application and brazed in the best way for each material. The diverse applications of heat exchangers include transport equipment, machinery, facilities, and electronic equipment. The temperature of the fluids can vary from - 50°C to some + 800°C. We have various types of heat exchangers as illustrated on the left, each of which we design applying our best-fit technology so as to contribute to the development of society.